Hyde Park, NY – Chef and TV personality Anthony Bourdain delivered the keynote address at commencement at his alma mater, The Culinary Institute of America, on December 19. 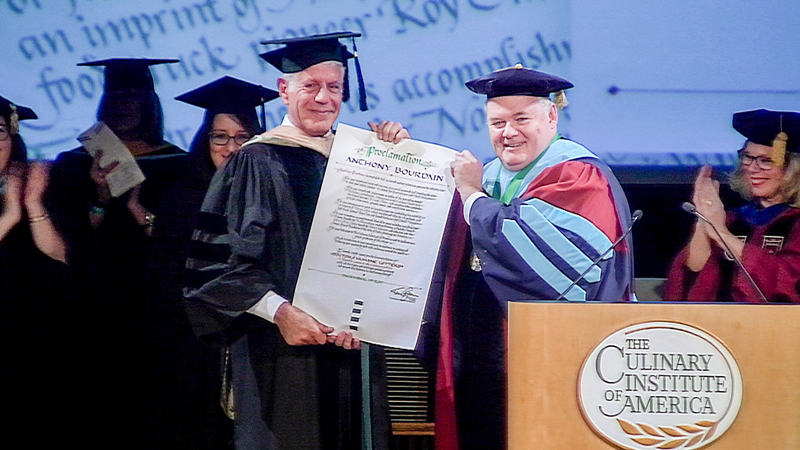 After giving advice to the college’s bachelor’s degree candidates, Chef Bourdain received an honorary Doctor of Humane Letters in Culinary Arts degree from CIA President Tim Ryan. After beginning his culinary career as a dishwasher on Cape Cod during summers while attending Vassar College in Poughkeepsie, NY, Bourdain enrolled at the CIA, graduating in 1978. During more than two decades of cooking at top New York City restaurants, he began writing. A magazine article in The New Yorker led to the bestselling Kitchen Confidential. Chef Bourdain went on to write several novels, non-fiction books, and cookbooks before turning to television. Both A Cook’s Tour and the Emmy-winning Anthony Bourdain: No Reservations featured episodes recorded at the CIA. He can now be seen on Anthony Bourdain: Parts Unknown on CNN, a show with five Emmy Awards for which he has also served as executive producer. The CIA graduation ceremony, including Mr. Bourdain’s address and the bestowing of his honorary doctorate, can be seen online.